Lobby Day is Valentine's Day, February 14th, 2019. ​Every year we develop an agenda of issues that are important to the midwives and consumers of Washington State. 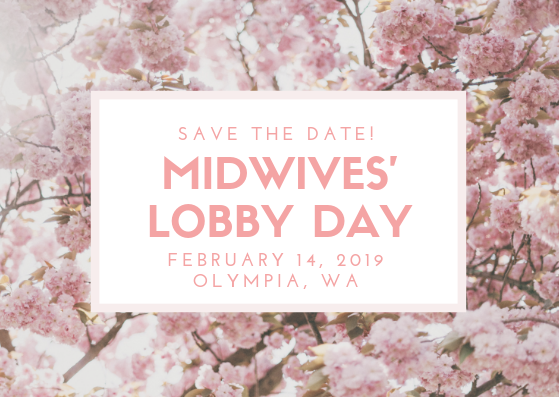 We meet in Olympia and travel in in teams to visit our legislators and educate them about the value of the midwifery model of care for families! Regarding inclement weather: Lobby Day will not be rescheduled unless the Legislature is closed. You can join our Lobby Day group text for the latest updates. Sign up here. Lobby Day is exciting and opportunities can arise at the last moment. We want to keep you in the loop! There are options to sign up via text message or the free GroupMe app. This will be a group text message thread that includes everyone participating in Lobby Day. ​Like to feel over prepared? Us too! We have lots of material to help you get ready for Lobby Day, whether it is your first time attending or not. You can even check out our entire Legislative E-Packet. This includes our Legislative Agenda, talking points, and all the documents and studies that support our claims and legislative asks. This is where we actually direct our legislators and their aides to better understand the issues. Check out these key documents and slides from our webinars to cover all the basics. Why is Midwife Lobby Day so Important? Ready to join us in Olympia? ​Lobby Day 2018 was very successful! ​and even a standing ovation. We hope you'll join us in 2019!